Hi guys! Hope you had a great long weekend! First of all, we wanted to let you know that we’re super excited to be featured as the DIY Superstars on Cut Out + Keep. All week they’re going to be sharing some of our favorite DIY projects, as well as an interview with us. Please check it out!! Andy (and his wonderful, helpful parents) spent pretty much the entire weekend painting our bedroom and en suite bath at the new house (remind us again why we didn’t pay someone to do it!! ), so I spent pretty much the entire weekend feeling bad that I couldn’t help because of this whole pregnant thing. That just means I get to help with other things, though … like online shopping! I’m soooo good at online shopping, and I can’t imagine I’ll ever be too pregnant for that. This weekend I bought all the supplies to give our guest half-bath a complete (much-needed!) makeover, yay! 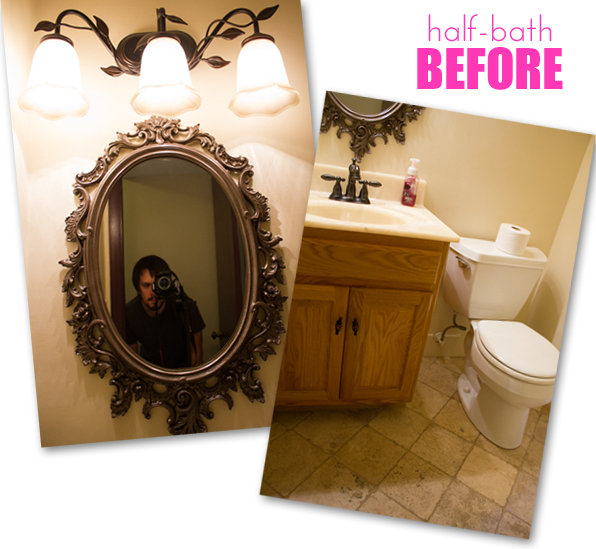 Remember what the half-bath looks like? The walls are beige, the floor tiles are beige, the sink top is beige and the wood vanity is beige. The light and mirror are … intense. The thing is, we don’t want to take a lot of time or spend a boatload of money to give this room a complete top-to-bottom renovation, and, really, that’s not necessary. Since it’s the bathroom that guests are most likely to see, we want it to feel more our style — affordably and quickly. So we’ve decided to give the room a whole new look for only a couple hundred bucks. We started by giving the walls a fresh coat of white paint, so it already looks a million times cheerier and brighter. Then we ordered a whole bunch of brass — the faucet, the light fixture, the towel bar and the toilet paper holder, along with a new frameless mirror (because is there such thing as too much brass? Plus the frameless was cheaper.). To give the room character, we’ll add some quirky, nautical-inspired art on the walls, and some cute new knobs for the vanity doors. Then, on our “someday eventually” list, we want to paint the vanity navy blue to tie everything together. I can’t wait for all the packages to start arriving. Totally the best part about online shopping, right? We’ll show you the things we bought once we know for sure that they’ll work. I’m really excited for our design plans, but what do YOU think?? !